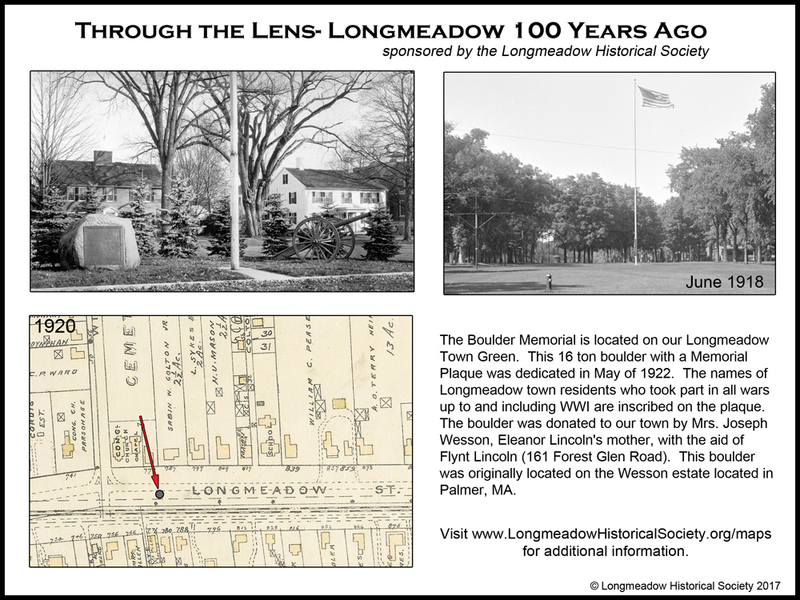 Opponents of the restoration efforts by the Longmeadow Historic Preservation Partners would have you believe that the proposed project to re-purpose the Brewer-Young mansion at 734 Longmeadow Street- built in 1885 would violate the trust given to town residents by Longmeadow's founding fathers. However, nothing could be further from the truth. As Part I of this series has shown, it was the businesses located ON the Town Green that were removed prior 1831. The land on the Green had been leased to shop keepers and when their leases expired, they were required to remove the shops from the Green. 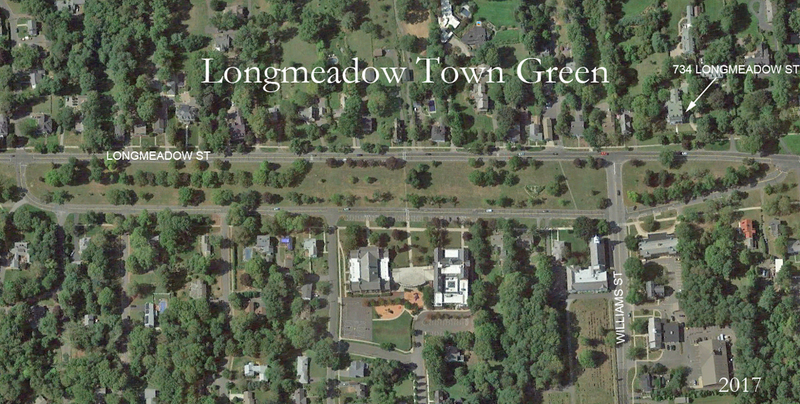 According to an 1831 map of Longmeadow there were no business shops located ON the Green. There were NO concerns expressed at the time about businesses such as the Cooley Store- now the Dr. Brooks/ Spa-on-the-Green (built in 1802) that were located AROUND the perimeter of the Green. It is interesting to take a look back at the Green during the 20th century. 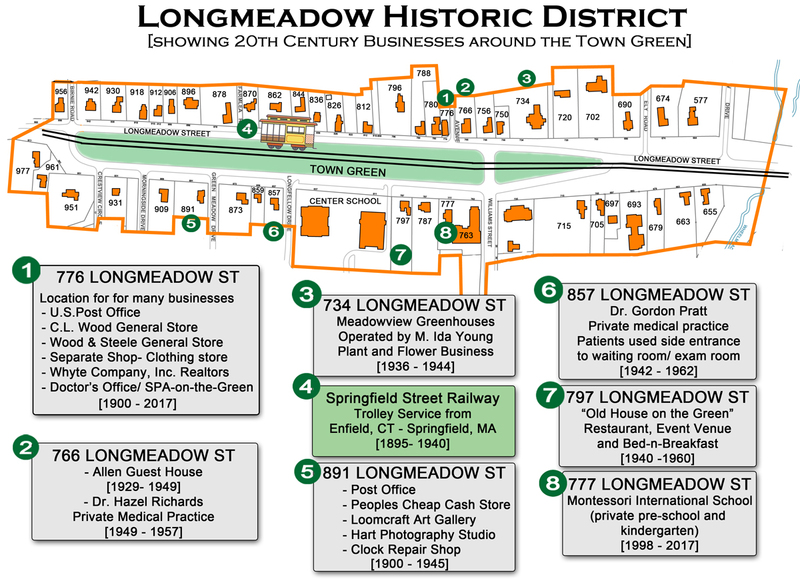 It turns out that in 1894 after the split with East Longmeadow, Longmeadow leaders granted a franchise to the Springfield Street Railway to operate a trolley service from Springfield, MA to Enfield, CT with two sets of trolley tracks + electric power poles. The path ran directly through the Green. See History of the Town Green- Part I for additional details, maps and photos. 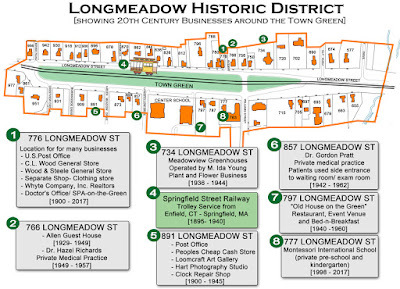 It is interesting to study the Longmeadow Historic District during the 20th century and learn that there were at least 18 different businesses located in 8 different locations AROUND the Green (see figure 2 below). Only two remain today- Dr. Brooks/Spa-on-the-Green and the Montessori International School. 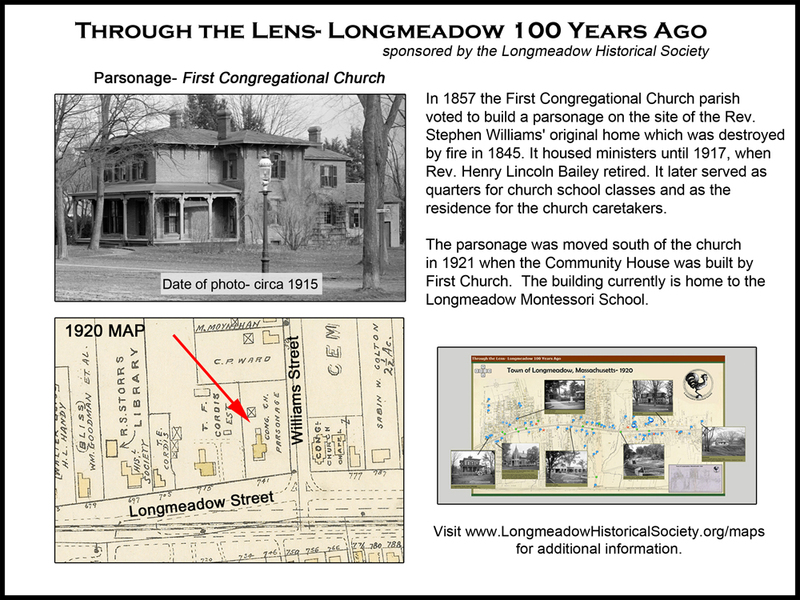 Remember... the Montessori School has been located for the past 20 years in the Old Parsonage that once stood at the location of the Longmeadow Community House. This mid-19th century home was re-purposed from the First Church parsonage --> private residence --> private school (see additional information). One other point that should not be forgotten. The Community House built in 1921 by the First Church of Christ for the Town of Longmeadow as a "community center" for all town residents was purchased by the Town in 1927. In recent years the Town has utilized significant space in the basement of the building for conducting town business operations- quite different from the original intent of the building. You might say that a significant portion of the Community House was re-purposed. WWI and WWII memorial monuments and a flag pole were added to the Green during the 20th century (see additional information). It was only after the trolley tracks were removed by the Springfield Street Railway in 1940 that the commercial aspect on the Town Green returned to its mid-19th century appearance. Question: How does the restoration of the Brewer-Young mansion cause any effect on the so-called "pristine" nature of the Town Green?Answer: It doesn't. Vote YES on January 25- Let's SAVE an iconic structure in our town.